Hi y’all, I’m posting this one a day early because Halloween has snuck up on me and I need to get it up ASAP so you can use it! 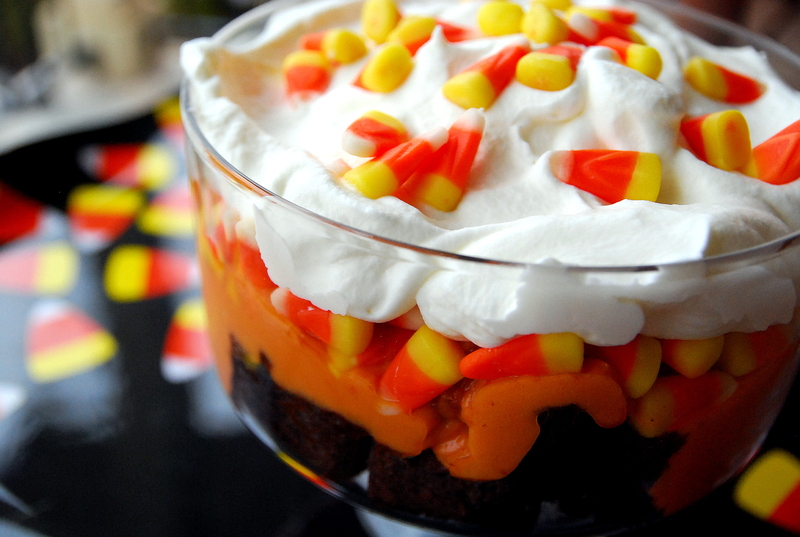 It’s a showstopping Halloween Trifle that looks waaaaaaay more complicated and fancy than it actually is. I took a little help from the store on this one, but I don’t think you can tell one bit. This trifle starts with a cake mix and a pudding mix, which is why it comes together in no time. I actually made the cake the night before and just did the pudding and whipped cream right before I assembled it. Besides looking so stinkin’ cute, this trifle is absolutely delicious. Rich chocolate cake, smooth butterscotch pudding and crunchy candy corns all jump in the dish together and get slathered in homemade whipped cream. The chocolate butterscotch combination is off-the-charts, making this one delicious for kids and adults. This one would be perfect for your Halloween party! You could also use Cool-Whip instead of the fresh whipped cream to make this even easier! My kids helped me assemble this one, so it’s not picture perfect, but no one seemed to mind! Preheat oven to 350 degrees F. In a large bowl, mix together the cake and pudding mixes, sour cream, oil, beaten eggs and water. Stir in the chocolate chips and pour batter into a well greased 9×13 pan. Bake for 30 to 35 minutes, or until center doesn’t jiggle when the pan is shaken. Cool cake thoroughly in pan. Pour butterscotch pudding mix, food coloring and four cups of cold milk into a large bowl. Using an electric mixer, whisk for for approximately 4 minutes, until pudding starts to thicken and you have reached desired color (add more of whichever color you think you need to reach the shade you want now). Place in the refrigerator for 5-10 minutes, or until ready to assemble the trifle. For the whipped cream, place all ingredients in a large bowl and mix with an electric or stand mixer until the cream forms stiff peaks. Refrigerate any unused portion in an airtight container for 1-2 days. To assemble the trifle, break cooled cakes into chunks either by hand or by chopping with a knife – 1 to 2-inch chunks are fine. Mix in approximately 1 cup of candy corn, using a fork to distribute. Spoon well chilled butterscotch pudding directly on top of cake, smoothing with a spoon or spatula. Cover with plastic wrap and refrigerate if not serving immediately. 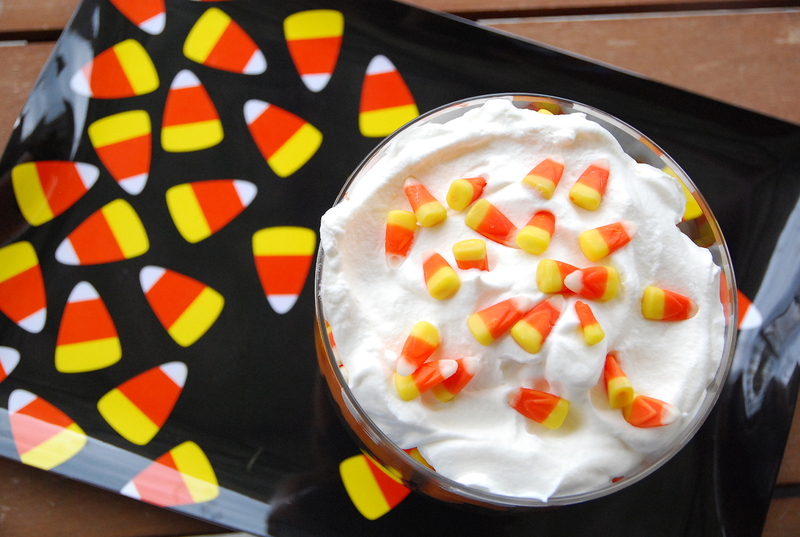 Just before serving, spoon freshly whipped and sweetened cream directly on top of pudding and garnish with more candy corn.